There are plenty of ways that you can explore a country when you go on holiday. It has to get said that the best way is by campervan! When you go on a coach or rail tour, you have to stick to a specific itinerary. And when you go by car, you have to find a hotel or campsite to stay at. But when you tour a country by campervan, you get to decide where you want to go and how long for. And the best bit? You don’t need to shell out extra money for accommodation because you’re already in it! Even though the colder weather is now with us, it still doesn’t mean you can’t explore the UK, Europe or beyond in a campervan. Are you thinking of getting away from it all and hitting the road in your camper? If so, this page is for you! One of the things that many campervan drivers seldom think about is the little luxuries they’re used to at home. 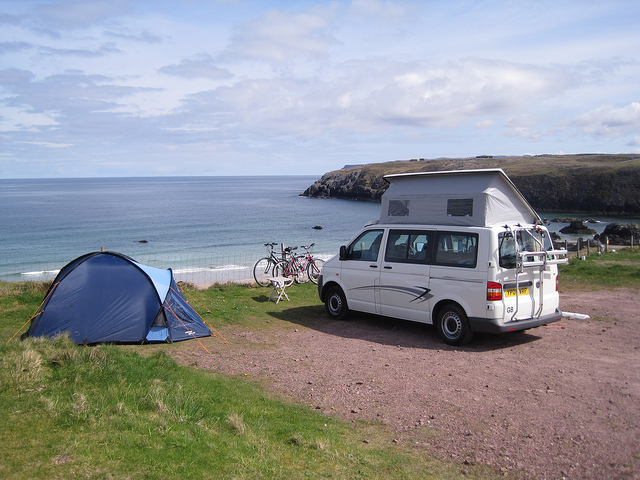 Did you know there’s no reason you can’t have those same luxuries in your campervan too? You might be wondering how on Earth you are going to lug a bulky CRT-style television into your campervan. After all, there is a limited amount of space in there, right? The good news is that such TVs are now a thing of the past! Today most people have flat-screen LCD TVs in their homes. You can lift them and carry them around under one arm, and they use far less electricity than their predecessors. The size of LCD TV you get will usually depend on how much space you’ve got to play with in your campervan. Most campervan owners fit their LCD TVs onto swivel bases. That way, they can pull them out when they want to use them and then slot them back into place when they don’t. LCD TVs are pretty inexpensive these days. These days you can pick up a 24-inch model with a built-in DVD player for less than £130! In the UK, all TV programming is now digital. There are dozens of TV channels and radio stations one can tune into, as opposed to just five analogue TV channels in the past. But what if you don’t want to miss your favourite TV programmes on satellite TV? The answer is simple: fit a satellite dish and receiver to your campervan! Some people have portable ones that you just mount where you want, like on the roof for example. The only downside is you need to point the dish in the right part of the sky to receive a signal! That’s not a big deal because you buy satellite signal detectors from places like eBay or satellite TV shops. All you need to know are the coordinates for your chosen satellite. If you want to unleash your inner geek, you could always invest in a mobile broadband wireless router! In a nutshell, they work in a similar way to your broadband or fibre routers at home. Except that you are using a SIM card and a mobile data connection, of course. 3G mobile data connections are available in most parts of the UK and beyond. But if you can get it, I recommend getting a SIM card and router that supports 4G. If you happen to be in a 4G-enabled area, your Internet speeds will be as quick as they are at home! But what if you’d like an easier way to get online in your campervan? An alternative is to share or “tether” the connection from your smartphone. Devices like the Apple iPhone let you share your mobile data connection by setting up a secure Wi-Fi hotspot. They are quick and easy to set up. The only downside is that the service may get disrupted if you have to make or receive phone calls at the same time. Not to mention your device’s battery life going down quicker than usual! Still, it’s a good solution if you want to keep the amount of gadgets you carry with you to a minimum. As a campervan owner, you need to be aware of the risks involved with having a lot of hi-tech gadgets in your pride and joy. Campervans are sadly a target for thieves as they know people will often take valuables with them on their travels. 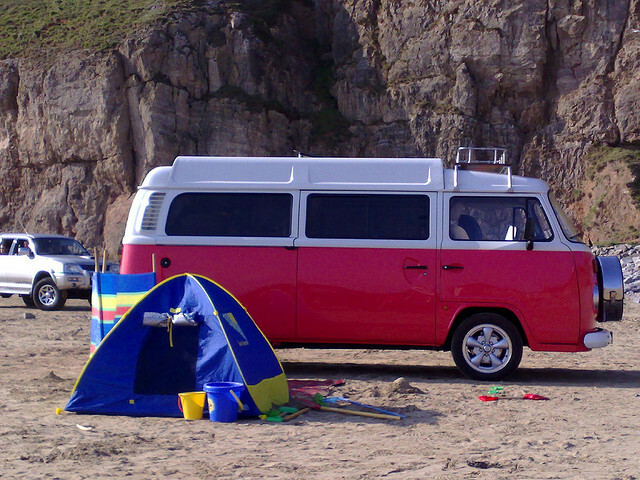 Although you’ve got insurance for your campervan, you should take out a separate policy to cover your gadgets. Many people organise gadget cover through their banks at a discounted rate. While others just do a Google search for reputable insurers. There are going to be times where you spend time away from your campervan. To ensure that it and your belongings are safe, I recommend investing in some decent security for it. As a bare minimum, you should have an alarm and immobiliser system fitted by a trusted car security firm. Some owners even have small, hidden safes built into their campervans. They do this to store valuables in a secure environment. They are tips you would usually associate with cars, but they also apply to campervans too. The ugly truth is that campervan break-ins are on the increase. But if you’re savvy about your security and parking habits, you will be fine. I hope you have enjoyed reading today’s article on campervan gadgets. Stay tuned for the next instalment on our blog. Thanks for reading!